Network, BELL EXPRESS VU and Viewer’s Choice Canada. 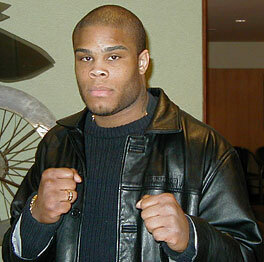 FCF: Gilbert, you’ve fought in Holland before, but this is the largest show that’s ever taken place here. What’s it going to be like fighting in front of so many of your hometown fans?? GY: Most of the fights I’ve done have been in Holland, and I’ve only fought in the big shows with 5,000 to 6,000 people. This time there will be 4,000 more. It’s my people – I have to win. Every fight I do I want to win. It doesn’t matter if there’s 10 people, 200 or 300 people, or one million people. It’s going to be a little bit easier for me when I’m tired because I’ll see my crowd around me, so it will be easier for me to fight better and harder. FCF: This show is huge for Holland. There have been shows in Holland before, but this appears to be the largest. What does it mean for the Dutch people to have both Thai Boxing and mixed martial arts on the same card? GY: This is fantastic for the people over here because every time they put on a big show here there were two people from the outside and the rest of the fights were Holland vs. Holland. On this card, all the fighters face someone from outside Holland so it will be great. It will be like Holland vs. the rest of the world. FCF: Is Thai Boxing still more popular than mixed martial arts in Holland? GY: No, not anymore. Every time they put a Thai Boxing fight here they always put two or three free fights on the card. On the boxing cards here in Holland they add Muay Thai and mixed martial arts fights on otherwise no one would come. The Thai Boxing is more accepted by the people than the freefight of the mixed martial arts. I think the people love the mixed fight more. FCF: You’re facing another grappler in Carlos Barreto. He’s not a big wrestler like Kazuyuki Fujita, but he’s still very experienced. The rules are geared more towards the stand-up fighters with the two-minute rule that requires stand ups after the fight goes to the ground. Have you focused more of your training towards the ground game since your fight with Fujita? GY: The last couple of months I’ve trained very, very hard on the ground with Remco Pardoel. My ground training is going very good right now. No one has submitted me on the ground before, so I don’t know why people think Carlos will submit me in our fight. I think it’s going to be a standing fight because he’s one-meter, 94-centimeters, which is very tall. When he shoots it will take him a long time to get low. FCF: Barreto isn’t the best at takedowns. He wants to get the fight on the ground, but his strength isn’t bringing the fight to the mat. Will you do everything you can to keep the fight on the feet? GY: Yeah, of course. I’m a stand-up fighter. What would I do on the ground? So I’ll stand up and punch him. FCF: Do you have a prediction on the fight? GY: I’m going to knock him out, straight out, cold out. I will win by KO. FCF: Thanks and good luck. NHB "Strikers" to fight in Muay Thai bouts. Two fighters who are making waves in the Mixed Martial Arts/NHB world for their striking abilities will be fighting in professional Muay Thai matches this Saturday, March 17th, in Los Angeles. Duane BANG! Ludwig and Pete "Secret Weapon" Spratt are both matched up on the upcoming Marconi Foundation fund raiser Muay Thai show. Ludwig is known for his great strikes thrown in the KING OF THE CAGE events and is also the current Extreme Sportfighting Lightweight Champion, while Spratt recently made a name for himself with winning the GSE Reality Combat Middleweight World Title against Rich Clementi. The show is a black tie affair with all the proceeds going to charity. The audience will not be full of your typical "fight fans". The white linen covered tables will be surrounded by some of the most powerful and influential businessmen in L.A. There will be no tickets made available to the public, all the seats are paid for by participating corporations. WARRIORS CUP OF AMERICA promoter Jason Luevano has been brought in as matchmaker and has done a fine job with the card. Ludwig, who was recently crowned the I.M.T.C. North American Middleweight Champion, will be facing Pedro Solano Villalobos. Mr. Villalobos was featured in the current issue of INSIDE KUNG FU magazine in an article about his training in Thailand. 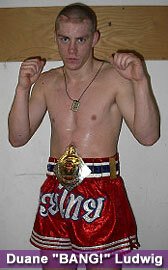 Pete Spratt will travel from Dallas, Texas to face local favorite "Cowboy" Heath Harris in a pro 5 round Muay Thai bout. 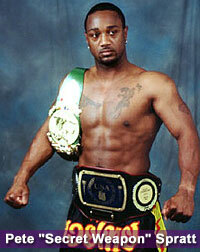 Other fighters on the card include ring veteran William Syrapai, and Dan "TANIS" Rawlings of Euclid, Ohio. Full results will be posted next week.